Ryvita Thins are a staple in my cupboard. My favourites are the Ryvita Thins multiseed flatbreads. There are other varieties too, including the relatively new Ryvita Thins Bites. These are small squares of flatbreads which are packed in a 155g bag, a bit like a large bag of crisps. The headline on the packs says '80 calories per serving’. But don’t be misled, as this amounts to roughly 10 Ryvita thins and not the whole bag. 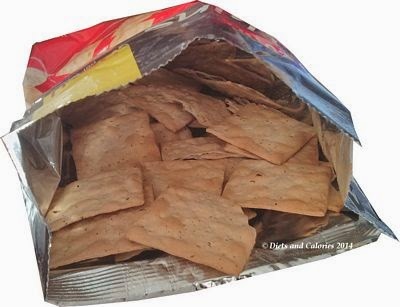 Ryvita Thins Bites are available in flavours: Sweet Chilli and Cheddar Black Pepper Thins which have 89 calories per serving. I purchased the Sweet Chilli variety. My main intention was to eat them as a dry snack, in the same way you eat crisps. However, they’re ideal for dipping into houmous or you could make lots of little hors d’oeuvres for people to eat. The chilli taste is mild and sweet, certainly not enough to set your tongue on fire. They’re very easy to eat on their own, but just a few are satisfying, possibly because of the spiciness. The bag comes with an easy seal closing tab to use when you’ve had a serving. Best not to much through the whole bag in one go as that will set you back 439 calories! You can find Ryvita Thins Bites in most larger supermarkets. Nutrition information per serving (about 10 bites): 80 calories, 2.5g protein, 16.3g carbs, 1.9g sugars, 0.3g fat, 0.1g saturates, 1.1g fibre, 0.36g salt. Other Information: Suitable for vegetarians. Contains wheat, rye, barley, (Gluten). May contain: Milk, nuts, eggs, soya, sesame seed.